With the weather and the water getting cooler, it is time to consider how a wetsuit can extend your fun-in-the-water season! Wetsuit technology has come a long way in the last decade or so, including designs that are specifically suited to windsurfing. Gone are the days when the thought of wrestling into your wetsuit was enough to make you think of booking a trip south (although we always endorse that idea too!). Here is a rundown of the improvements and features to help guide your wetsuit decision. A wetsuit keeps you warm with a thick neoprene fabric, which is a synthetic rubber, and by trapping a layer of water between your skin and the wetsuit, which your body heat warms up. The less often that warm water gets exchanged for cold water, the warmer you will stay. That is why you want your wetsuit to fit snugly—excess space means it holds more water that won’t get as warm. The suit construction can also make a difference. Thicker neoprene is warmer, but can limit mobility. A wetsuit that has taped seams will be warmer than one that just has stitching since water can come in and out through each needle hole. Suits that have a gusset inside the zipper are also warmer as they prevent cold water from flushing in. Wetsuits were once the same for everyone, no matter what sport you were participating in. The wetsuit you need if you are windsurfing is much different than a dive suit or even a surfing suit. When you are active in the water, you want a suit that is warm without being so thick and bulky that it is hard to move so as not to tire out your arms. Wetsuits that help block the wind from your torso can add significant warmth without adding bulk, which is great for wind sports. Windsurfing-specific suits are usually cut a bit bigger through the biceps and forearms so you can hold on to the boom longer. Some wetsuits, like the Ion Strike and the Severne Impact, even have extra padding in key areas to protect you from crashes, bumps, and bruises. How thick should your wetsuit be? Generally speaking, thicker wetsuits are warmer, but less flexible. Suits that are designed to take the chill off in warm conditions are 2mm thick, while a wetsuit that you would use in cold temperatures might be 4mm or 5mm thick. You will want to consider both the temperature of the water that you will be in, as well as the likely air temperature, and of course your own tolerance for being cold or hot. A 2mm shorty (short-sleeves and short-legs) is most useful in water temperatures from about 66-80 degrees. If you have a long-legged, short-sleeved suit that is 3mm or 4mm thick, you will likely stay warm in water temperatures in the upper 50s. For water that is colder than that (or colder air temperatures, or cloudy days) you will want a long-legged, long-sleeved suit that is 4mm or 5mm thick. Smooth skin or nylon coated? Smooth skin wetsuits are made with bare rubber neoprene that is more wind and water resistant and will absorb heat from the sun to help keep you warm. However, the smooth rubber finish is not very durable and can be torn by your fingernails when you are pulling it on. More commonly, you will find wetsuits that have a nylon coating on the neoprene so that it is more durable. It used to be that windsurfers wanted to make sure they had a smooth skin suit for extra warmth in the wind. Today, with the improved stretchiness of modern wetsuits, you can stay just as warm with a non-smooth skin suit that is a bit thicker than your old smooth skin suit and be just as comfortable. Back zip, front zip, or zipless? Traditionally, scuba diving wetsuits zip up the front and surfing or windsurfing wetsuits zip up the back (you don’t want to be laying on a zipper on your surfboard, or have a zipper being pushed against your stomach by your windsurfing harness!). Newer wetsuits have a variety of zipper placement options. A full length back zip suit is the easiest to get in and out of, but you do get cold water coming in through the zipper. Higher quality suits will have a gusset inside the zipper to keep the cold water away from your skin. 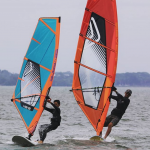 Front zip windsurfing or surfing wetsuits have a short zipper that runs horizontally across the upper chest. This keeps the zipper out of the way and adds flexibility and comfort across the back of your shoulders as well as keeping more water out. However, a front zip suit is more difficult to get on and off - especially as the neoprene gets thicker. If you have injured your shoulders or have restricted shoulder mobility you may find it quite difficult to manage with a front zip suit. There are even some super stretchy wetsuits (usually in the thinner neoprene construction) that don’t have a zipper at all! These suits feel great on because there is no restriction to your movement or chaffing from a zipper. But you can feel a little bit like a contortionist when you are putting them on. Have any questions? Let us know and we’ll help you find the best wetsuit for your needs.